In these days of supermarkets and pre-packaged foods it can be easy to not think about or even forget where our food comes from. All plants where once growing wild and eaten and then went on to be selected and bred for their particularly favourable qualities such as resilience, size of crop and flavour. It is still possible to find the wild ancestors of our modern foods, often growing in the most unlikely places. 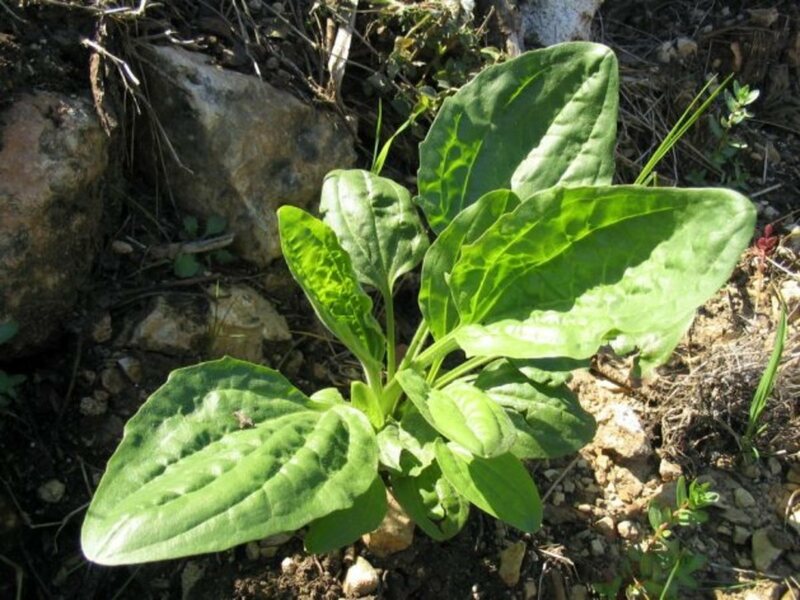 These plants can be collected and eaten just as they were in past times and add variety and new tastes and textures to meals and snacks as well as many be able to be eaten alone. Foraging is the seeking out, identifying and collecting of wild growing plants, roots, seeds, mushrooms and other edibles and is becoming enjoyed by more and more people as time goes by. 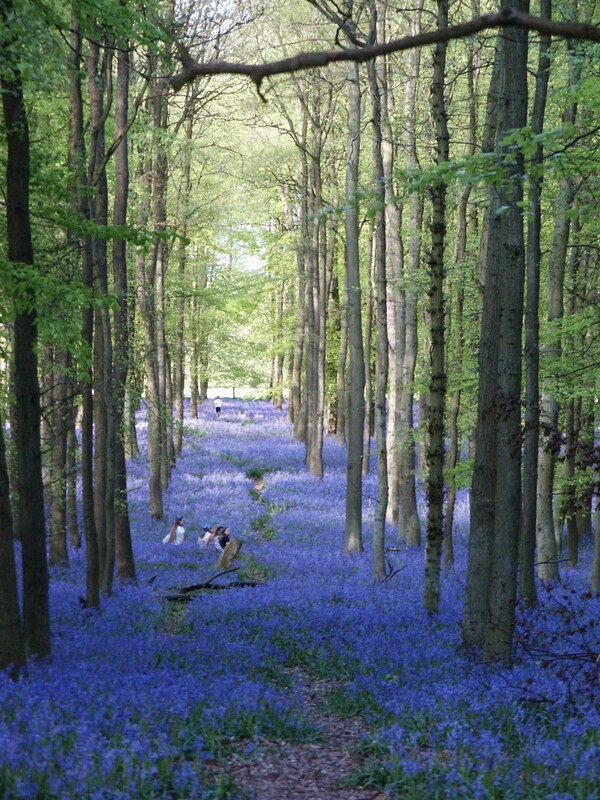 Foraging can be combined with other outdoor activities such as walking, jogging, cycling or geocaching or purely on its own. Food collected can then be used in a variety of ways. 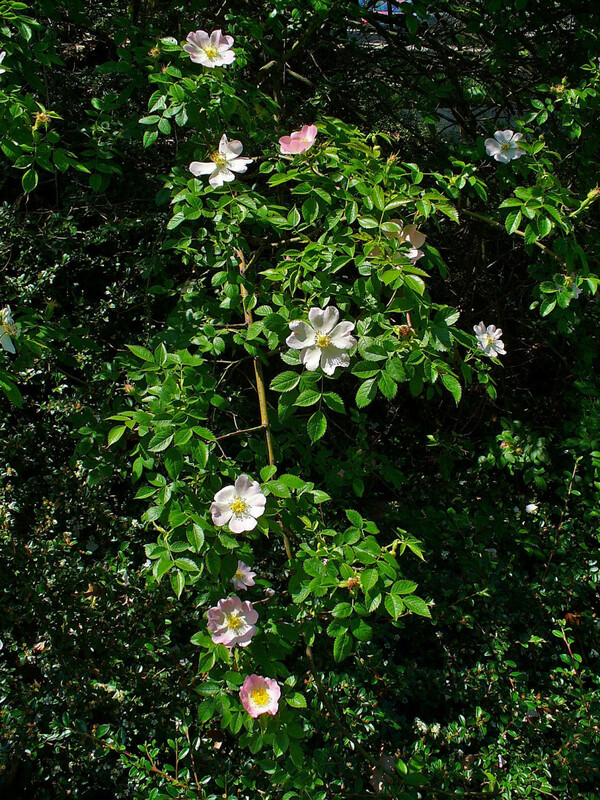 Some plants are easily identified by distinguishable features such as look or smell but others are much harder to recognize or can be very similar in looks to harmful or poisonous plants. This is particularly true of some wild mushroom varieties and it is important to be sure of what you are picking in these cases to avoid the possibility of illness and in some cases death. Take care and time to learn how to identify plants before picking them, either through a good field guide or wild food book or by accompanying more experienced foragers until you gain more experience. There are now many courses and trips that can be joined to learn about foraging and also share foraging tripswith other like - minded people. Like any food, wild foods have the capability to cause allergic reactions or other unwanted effects. It is always worth trying a small amount of a new food in the first instance as a test, especially if you have other food related allergies, intolerance or other issues. While foraging you should never strip a plant of all its leaves, seeds, nuts etc. Take small amounts from several plants rather than many from one so that the health of plant is not affected negatively. Pick carefully and use a sharp knife or scissors when possible. Be mindful of leaving enough for other people to enjoy as well and that there may also be animals who rely on the foods to survive. Be wary of gathering plants from near roadsides or anywhere they may have been sprayed with chemicals such as insecticides or weed killer. The same applies to edible flowers bought from garden centres or other shops unless they specifically say that they are intended for eating. Otherwise they may have been sprayed with plant foods and other things unsuitable for human consumption. Try to use a flat open basket of other container to carry your finds so they do not become squashed or otherwise damaged. Alexanders (Smyrnium olusatrum) – Widespread throughout hedgerows and waste spaces, this bushy flowering biennial plant grows up to 1.2m (4ft) tall. 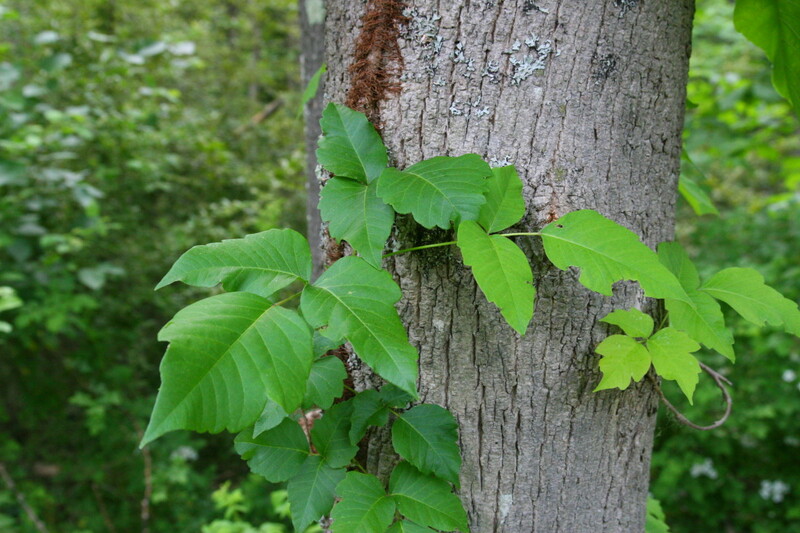 Its leaves grow in groups of three on the end of a leaf stalk. 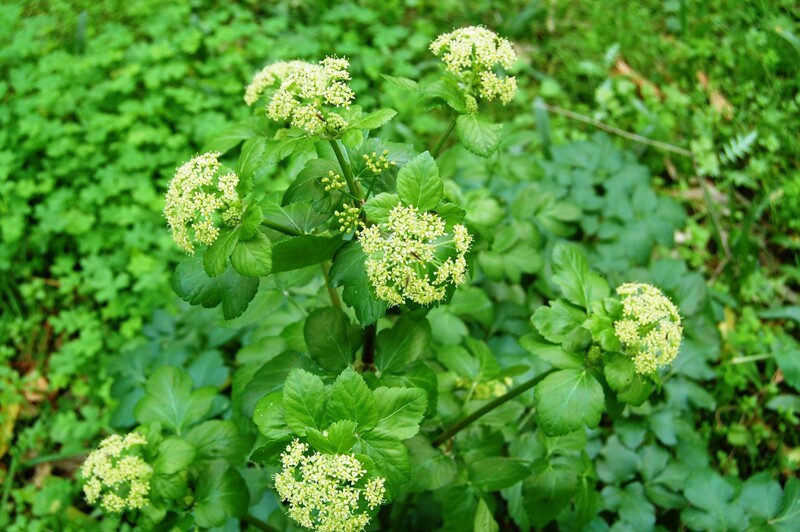 When in flower, alexanders has umbels of yellow – green flowers. Alexanders can be found between April and June and use cooked or raw. Uncooked young leaves can be added to salads and flower buds can be pickled. Cook alexander stems in boiling water until tender and eat with melted butter as you would asparagus. Beech (Fagus sylvatica) – This deciduous tree is widespread across the British Isles. 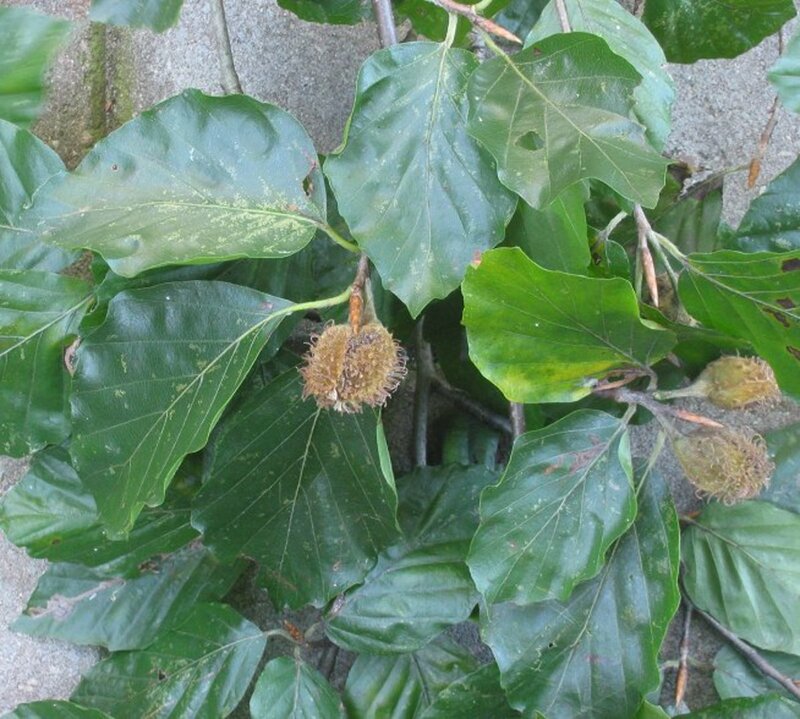 Beech trees only fruit every three or four years but produce a large amount of nuts. The nuts are very small and should be collected as soon as possible between September and October, so they do not dry out. Beech nuts can be eaten raw roasted or salted and taste similar to young walnuts. Beech leaves can be used as a salad vegetable and although they are softer, have a sweet mild cabbage like taste. 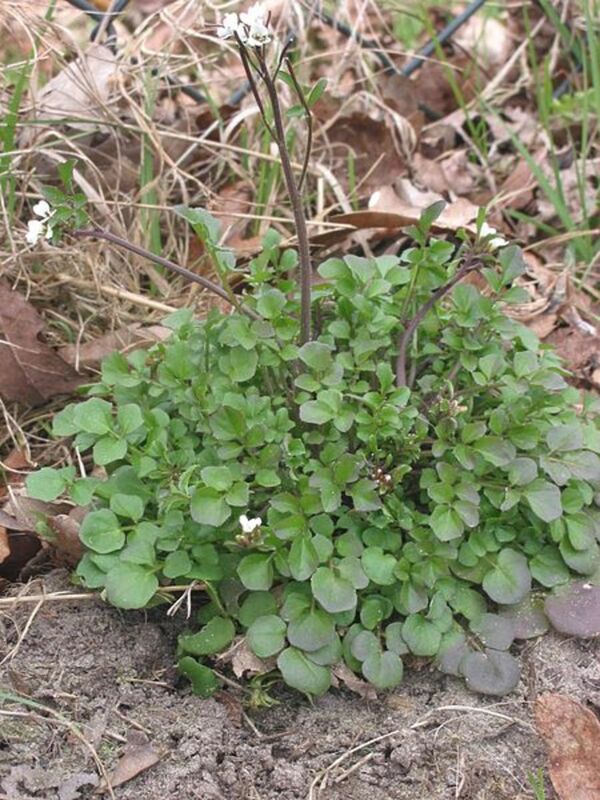 Hairy Bittercress ( Cardamine hirsuta) – Hairy bittercress has a tangy taste and is sweeter than watercress. 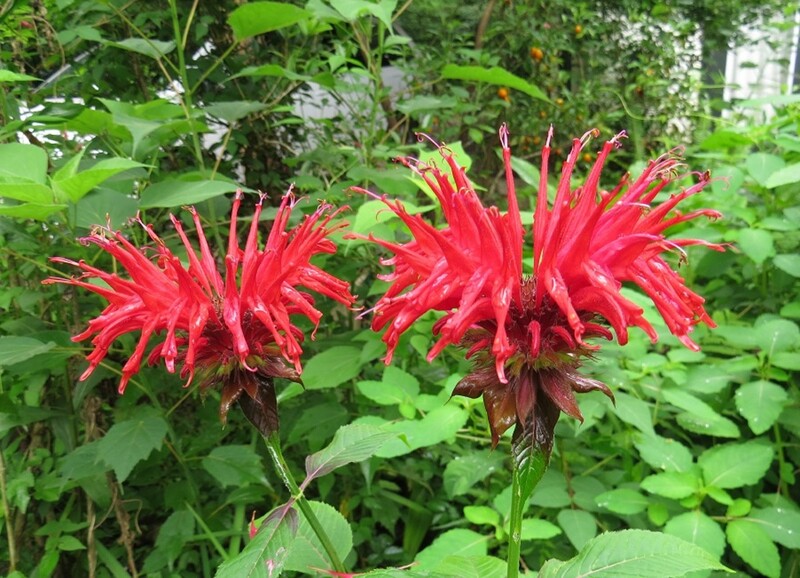 It grows freely in gardens, parks, waste grounds, on walls and along paths from February to September. The whole plant is edible and has a sweet and mildly peppery flavour. Use the leaves in salads or sandwiches. They team up particularly well with cheese. 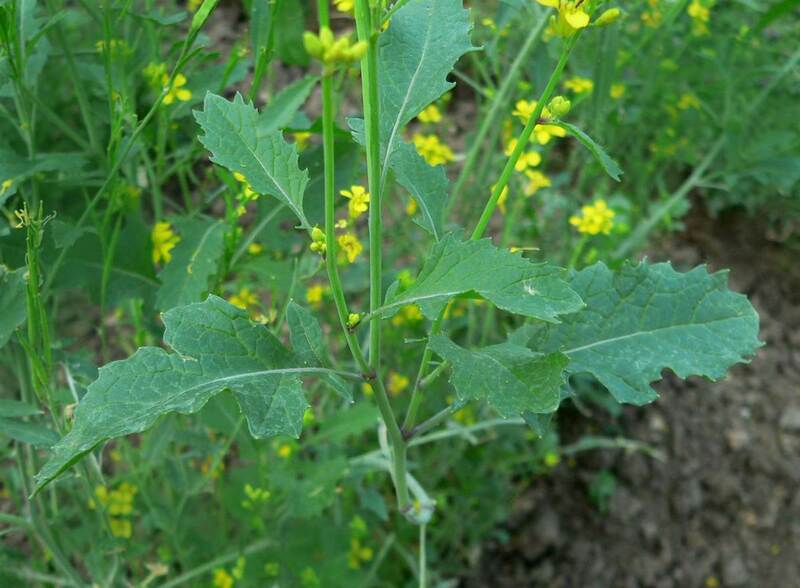 Black Mustard (Brassica nigra) – When the seeds of this plant ripen between August and September they can be harvested and used in cooking. Young leaves can also be used in salads or as cooked greens. This common and tall annual can be found growing along paths and on waste grounds. Blackberry (Rubus fruticosus) – This widespread, prickly shrub will grow just about anywhere and is common in hedges, woodland, waste spaces and parks throughout the Uk. Sometimes known as brambles, particularly in the north of England and Scotland the deep purple blackberries are ready to pick around September. They are commonly used in fruit pies and crumbles but can also be eaten raw or used to make jellies, jams, fruit fools, fruit salads or juiced. 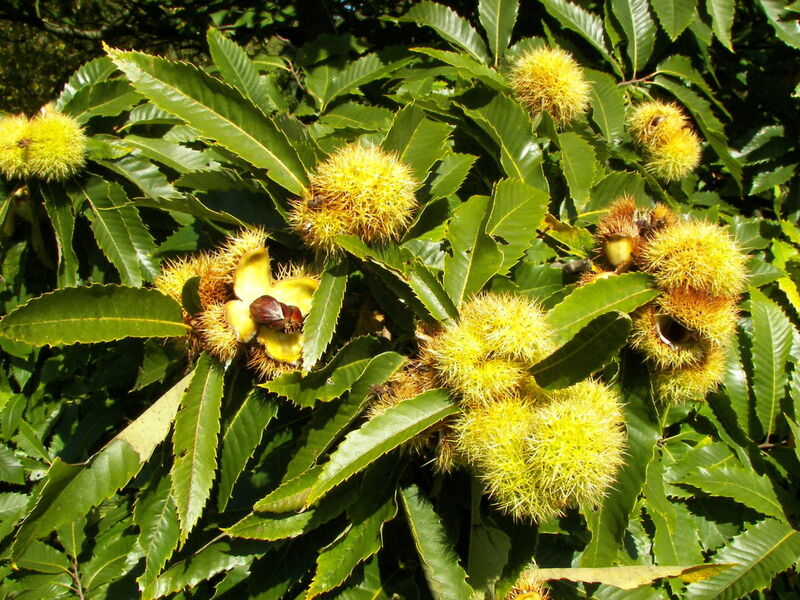 Sweet Chestnut (Castanea sativa) – Sweet chestnut trees can be found in woods and parks throughout England. They have yellow male flowers with the green female flower at the base. The nuts are produced here between October and November and are group in twos or threes inside a spiny green case. The case is best split while wearing sturdy gloves such as those used for gardening. Chestnuts can be roasted or made into flour which is nice for baking but should be used half and half with self-raising flour as it does not rise well on its own. 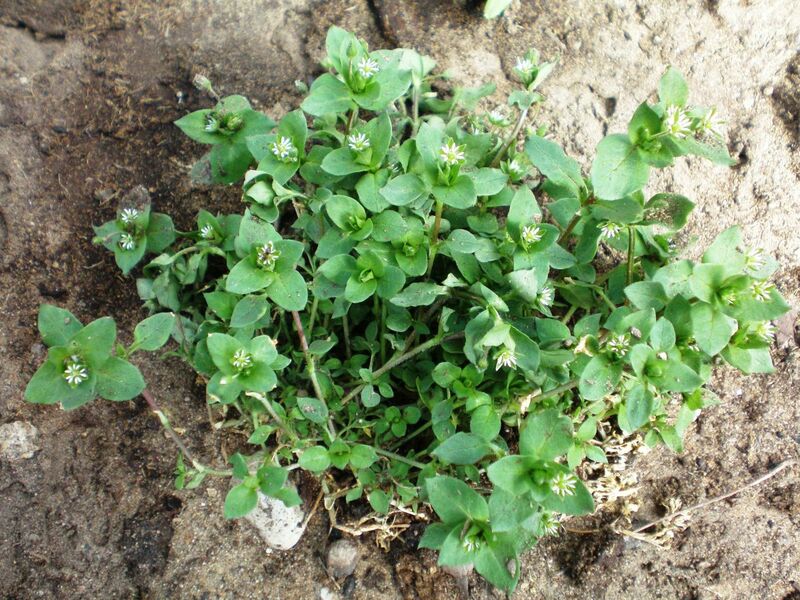 Chickweed (Stellaria media) – Often considered a nuisance by gardeners, chickweed can be found at almost any time of the year and both the leaves and stems can be eaten. 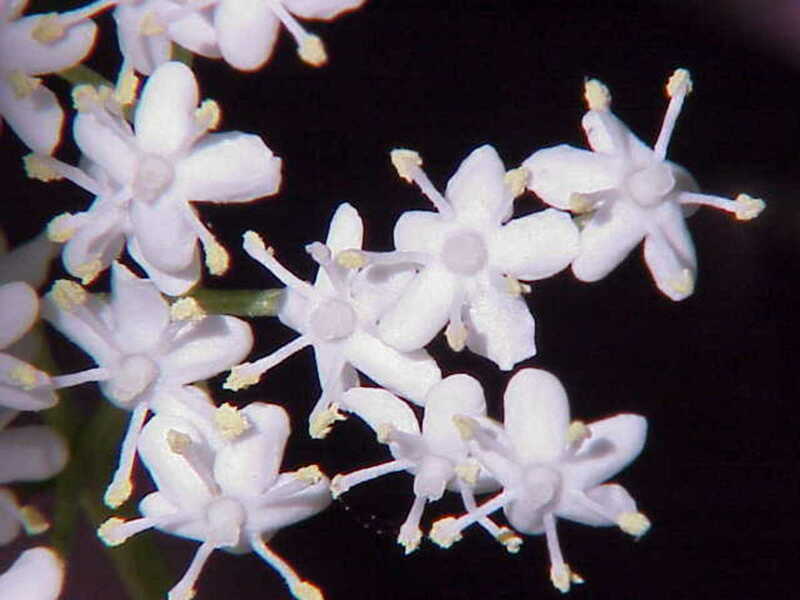 It is a creeping annual that flowers throughout the year with tiny white star shaped flowers. Stir fry in butter with a little seasoning and chopped spring onions or mix with dandelion leaves, Jack by the hedge and hairy bittercress for a wild food salad. 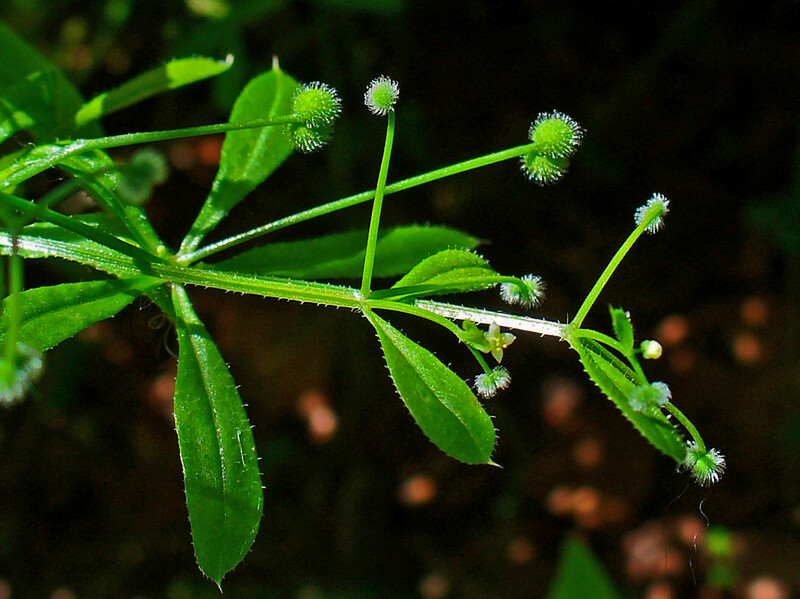 Cleavers (Galium aparine) – Also known as goose grass, this straggly bristled plant is often well known by children due to its ability to stick to their clothes. Cleavers grow abundantly and flower around May to June. They can be boiled as a green vegetable but many people find it too stringy to be really enjoyable. 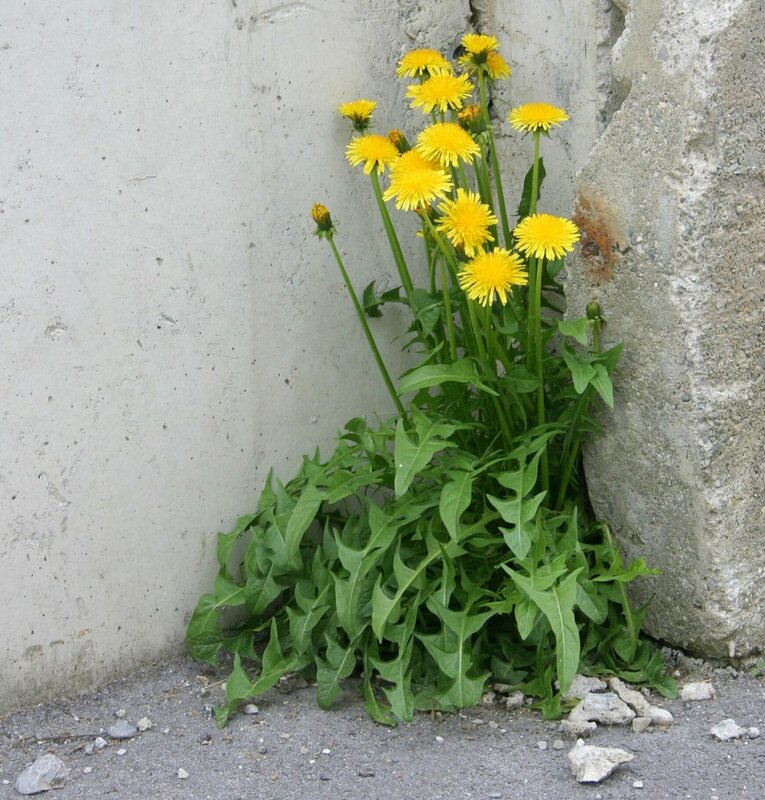 Dandelion (Taraxacum officinale) – Dandelions are easily recognised by their bright yellow flowers. The flowers, leaves and roots can all be used. Young leaves can be used in salads mixed with other leaves on on their own and dressed with olive oil, lemon and garlic. Roots are best dug in the autumn as the taste will have mellowed. Scrubbed clean and dried by roasting they can be ground and used instead of coffee to make a hot drink. Dandelion roots can also be eaten. The flowers can be made into jam and wine. Dead – Nettles (Lamium species) – Although these are called nettles they do not sting and so are easier to collect and use. Both white (Lamium album) and red (Lamium purpureum) dead-nettles can be found in gardens, woodlands, along paths and hedgerows or on unused land. They are hairy with a square stem, growing to around 60cm high. 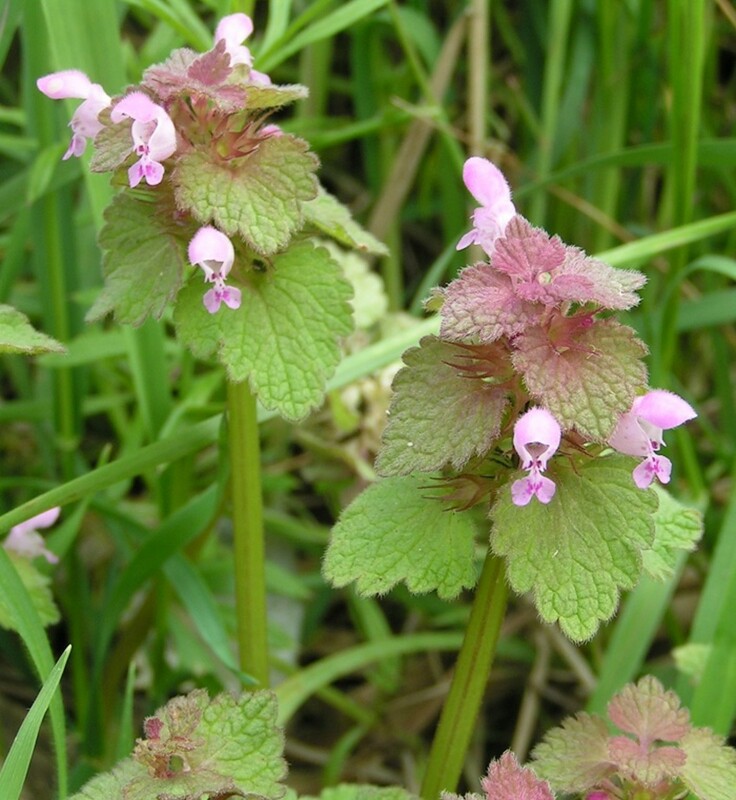 Although called red dead-nettle the flowers of this variety are in fact a pinkish-purple. Cook in butter with salt, pepper and spring onions then top with nutmeg and a little lemon juice. Elder (Sambucus nigra) – Elder is a commonly seen hedgerow and woodland tree, easily recognisable by its many clusters of tiny white flowers and later dark berries. 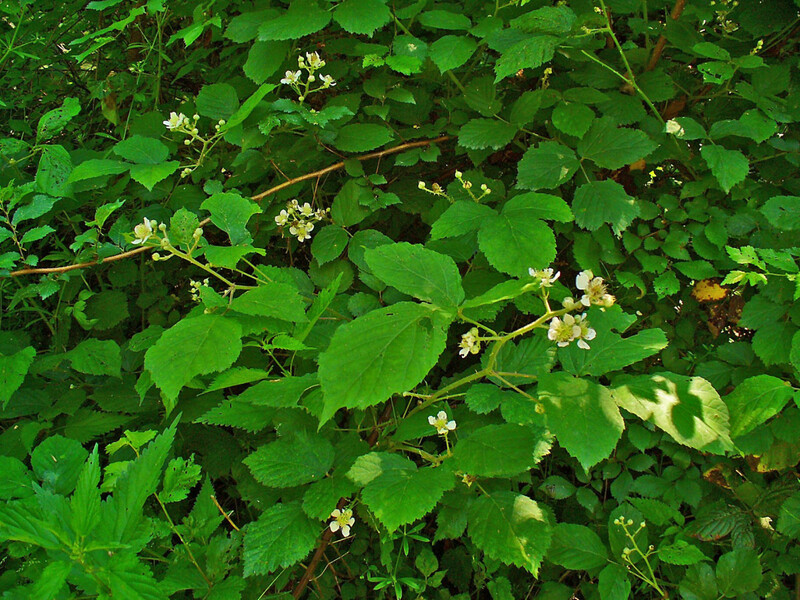 It flowers in the spring and then later produces clusters of small black berries. Elderflowers have a lovely fragrance and can be used to make wine, cordial and syrup. They are also dipped, in their clusters into batter and fried to make elderflower fritters. Elderberries are a good addition to fruit pies and crumbles and also can be used to make jam, wine and cordial. Blackberries and elderberries are ripe at the same time and go nicely together with apple in a pie or jam. 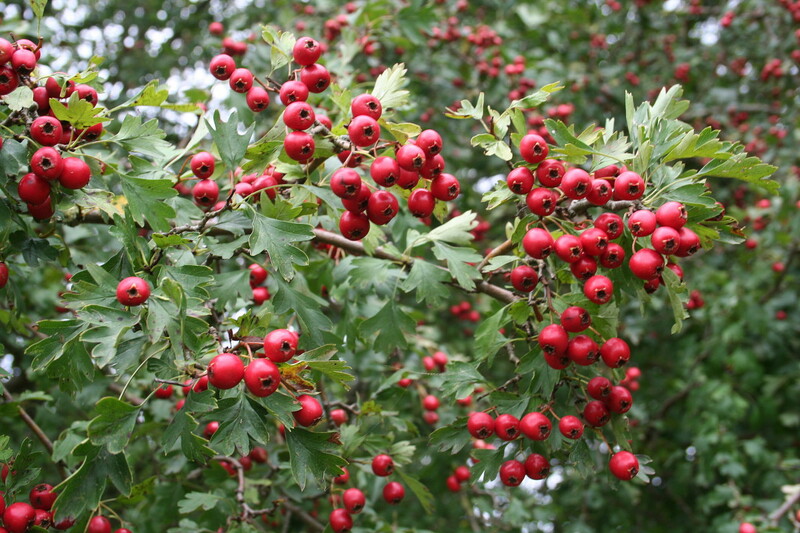 Hawthorn (Crataegus monogyna) – Found in woods and hedgerows, hawthorn is common throughout Europe. Young leaves can be picked between April and May and have a nutty taste. In the autumn hawthorn berries can be collected and made into jam or jelly. The leaves can be finely chopped with other greens such as jack by the hedge or sorrel, dressed with vinegar and brown sugar and then used like mint sauce. 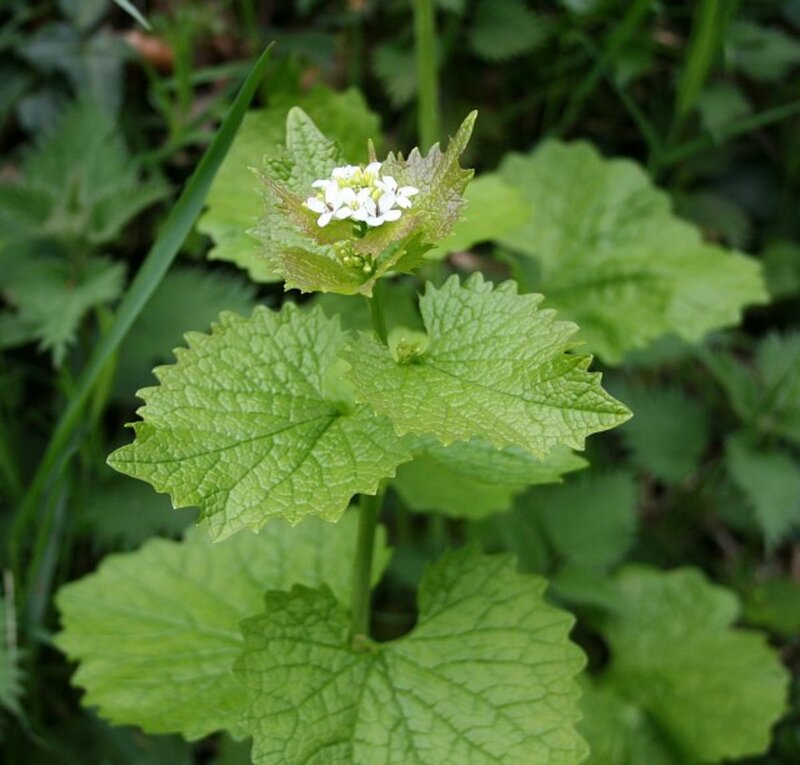 Jack by the hedge (Alliaria petiolata) – This tall, up to 70cm, plant is used for its mild garlic taste and is also known as garlic mustard. Leaves can be added to salads or sandwiches or made into a sauce for lamb along with hawthorn buds. Though unrelated to garlic, when bruised or chopped the leaves give off a slight garlic aroma. Rosehip (Rosa canina) – Rosehips can be found growing in hedgerows on tall thorny bushes and have been used as food for centuries and during the Second World War they were used as a rich source of vitamin C.
Rosehips contain as much as twenty times the vitamin C of oranges. Collect the hips from late August and they can be minced and used to make syrup. Care must be taken to remove all the prickly seeds from inside as they irritate the stomach if eaten. The syrup can be used to flavour milk puddings, ice cream or yoghurt and also can be diluted with water to drink. 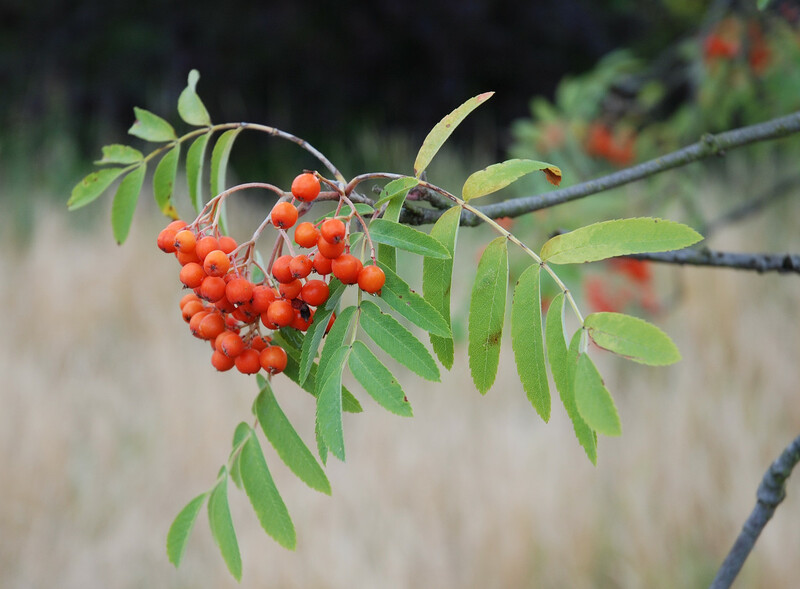 Rowan (Sorbus aucuparia) – Especially widespread in the north and west of Britain the rowan tree is often planted along roads and in public spaces. This small tree, also known as mountain ash fruits in autumn with clusters of orangey red berries. Rowan berries are best picked in October and can be used to make wine, jelly or jam. Combine rowan, blackberries and elderberries with apples to make a hedgerow jam. 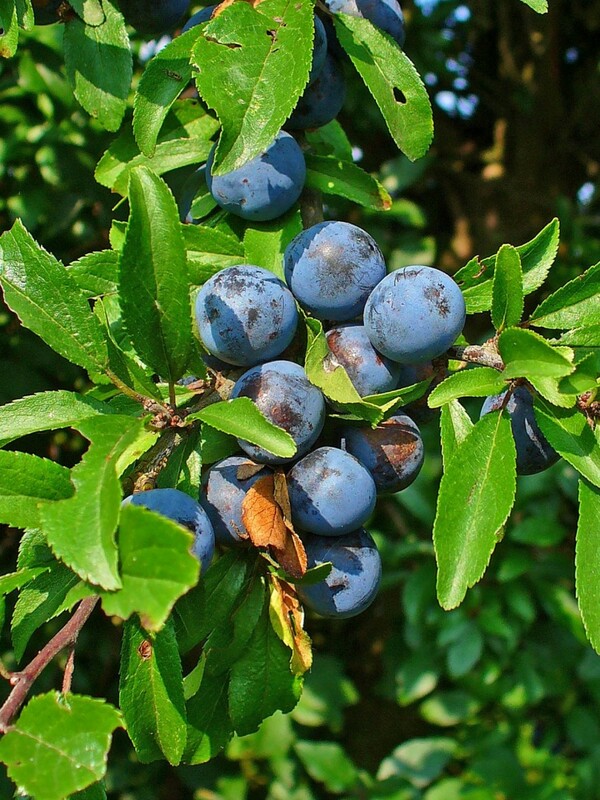 Sloe (Prunus spinosa) – This dense shrub grows up to 20ft high and is widespread in the British Isles. It flowers in March and April, which are then followed by the small, round dark blue sloe berries. Sloe berries are incredibly tart and acidic when eaten raw but they can be used to make nice jams or jellies and sloe gin. Sloes are best picked after the first frost as this softens the skins and make them more permeable. Walnut (Juglans regia) – Wild walnut trees can sometimes be found in parks or growing as a result of nuts dropped by people or birds. The nuts are enclosed in a fleshy green case and are best when picked in late October and November. However younger walnuts can be used to make a pickle. 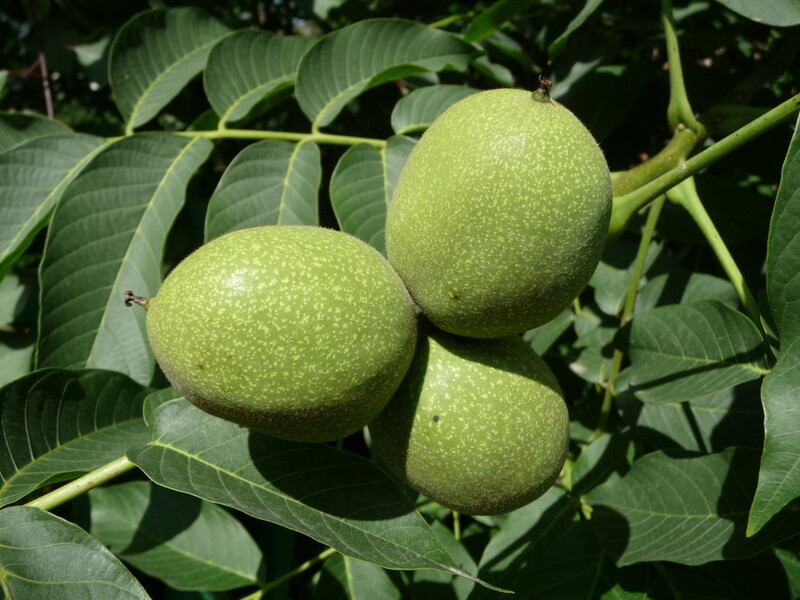 Walnut trees are deciduous and grow to around 100ft high. Although foraging is generally legal there are some legal matters that you should be aware of before heading out. The Theft Act (1968) states that it is legal to take mushrooms, foliage, fruits and any other part of a plant without committing any offense as long as you are not foraging for commercial purposes. If you intend to sell or profit from the items that you have collected, in all cases by law you must have the permission of the land owner to collect them. Care should be taken to adhere to the laws regarding trespassing. Entering any land that is not common land, open access land or that has public right of way can be considered as trespassing if you do not have the land owners permissions. This is true regardless of what you intend to do with your foraged items. 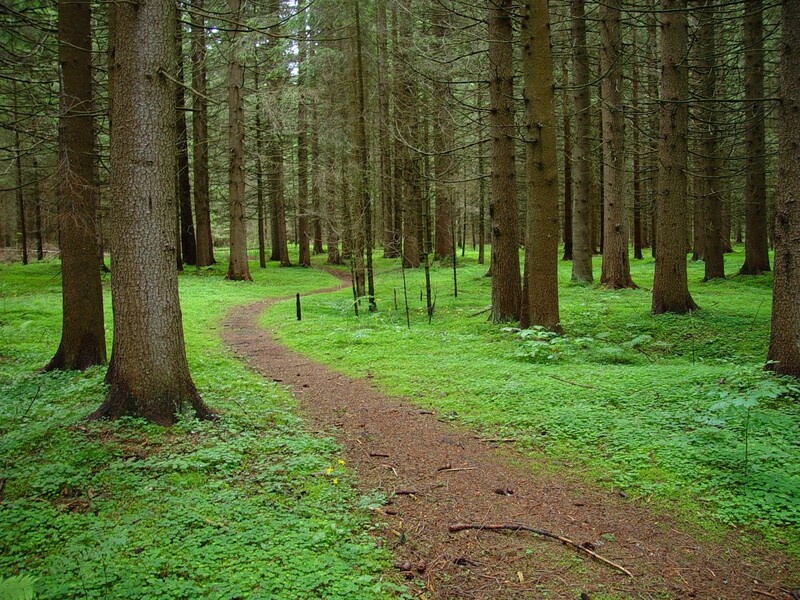 The land owner has the legal right to ask you to leave their land immediately and by the shortest route possible if they do not wish for you to be there. The Wild Mushroom Picker's Code of Conduct gives lots of good guidance on good foraging practice including always following the Country Code and taking care to minimise any damage to plants and the environment. The Wild Mushroom Picker's Code of Conduct can be found at http://www.britmycolsoc.org.uk/mycology/conservation/code-of-picking/. The Countryside Code can also be downloaded from the GOV.UK website at https://www.gov.uk/government/publications/the-countryside-code. As well as considering country wide law it is advisable to check local by-laws before foraging in any area. These may contain further restrictions, for example restricting the collection of any forest growing items. I am not sure if they grow in the US, sorry. Maybe they are called by a different name? This Wikikpedia page states that there are some varieties that do grow in the US http://en.wikipedia.org/wiki/Elderberry. Or perhaps you would be able to buy some dried flowers by mail order to use. Do elderberry plants and elderflower grow in the US anywhere? I order the cordial online and it's made in the UK. I would love to make my own. Thanks for the informational article; some of the plants I have not heard of here in the US, but maybe the names are different. I know we have the mountain ash tree which you called the rowan tree. I agree that a lot of people seem afraid. As a child I can remember parents telling their children it was dangerous to do so and so I expect they have that fear deeply instilled. As a child my brother and would pick blackberries for our mum. We'd always end up eating half of them too! I find it fascinating, I enjoy cooking and gardening so new ingredients are always welcome. I also have a pet tortoise whose idea diet is safe weeds so I have learnt to identify a lot of plants that way as well. There are some plants I am very confident forging for as I know them well and have used them but I do feel a bit unsure sometimes when trying a new plants. I have never picked wild mushrooms as I don't feel I know enough about them to be safe. I'm a forager myself, but mostly for herbs to use in my practice. I do love learning about the forest's supply of food though! It seems that most people are scared to forage and learn about nature's resources anymore...which is a very sad thing indeed.